There's no cost, and we promise not to fill your inbox with promotional clutter - just a useful, informative monthly newsletter. And we will never sell or share your email information. Review past issues at our resource hub. Your e-newsletter is far more professional and useful than others I receive (and inevitably delete). Yours isn’t just an advertisement, but contains valuable information. Keep up the great work. 1. Click the link below to go to our GDPR-compliant subscription form. 2. 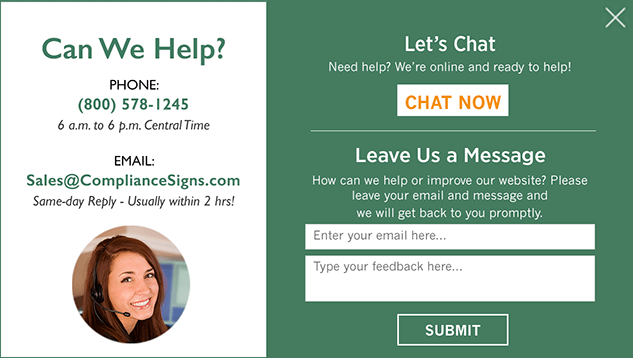 Add connection@compliancesigns.com to your email address book to help ensure delivery. 3. Watch for a confirmation email and follow the directions to complete your subscription.